DALLAS - His week began thousands of miles away with a frantic bid to save a life. Ten days later, he'd become the first person diagnosed in America with Ebola. The first patient may to have Ebola in West Africa may have been a two-year-old boy who got sick and died in Guinea in December 2013. His mother, sister and grandmother reportedly died soon after, infecting others in the process. It is unclear how the child might have caught it. Liberia has been hardest hit, with more than 3,800 cases and slightly more than 2,000 deaths. But even those ghastly numbers likely underestimate the scope of the disaster and the true toll may never be known. The World Health Organization has noted that in the notoriously overcrowded slum of West Point, in the capital, bodies are just tossed into the river. The horrifying impact of Ebola can be seen and heard throughout Liberia's capital, from corpses on the street, men pushing the sick in wheelbarrows and the constant wail of ambulances. Even a public service phone message warns "Ebola is real" before a call comes through. When Duncan arrived Sept. 19, his temperature was taken and recorded on a passenger screening form. It was 97.3 degrees Fahrenheit. Citing the Ebola outbreak, the form notes: "We need your help to prevent the spread of this disease." The form asks travelers if they have any of 10 listed symptoms - among them, fever, vomiting, diarrhea, stomach pain and fatigue. Duncan answered "no" to all. He also was asked if he'd taken care of an Ebola patient or touched the body of anyone who'd died in an Ebola-stricken area in the last 21 days - the incubation period. He answered "no" to both questions as well. 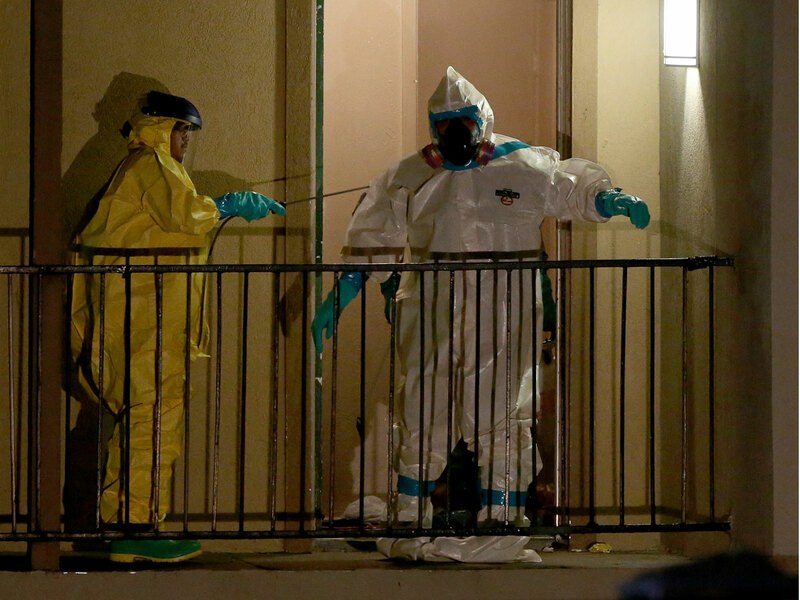 It's unclear if Duncan knew he may have been exposed to Ebola when he boarded his plane. While he had close contact days before with the pregnant woman, who neighbors now believe died from Ebola, she was never tested. It was initially suspected she had died of complications from her pregnancy. Duncan was staying in a second-floor apartment with Louise Troh, her 13-year-old son, Duncan's distant cousin and a family friend. On Sept. 25, Duncan was feeling sick enough that he went to the emergency room at Texas Health Presbyterian Hospital. He was reported to have a fever, headache and abdominal pain, but no diarrhea or vomiting. The hospital said he told them he'd recently arrived from West Africa, but that he denied having been around anyone sick. He was released. By Sunday morning, Duncan's condition had worsened. Youngor Jallah, 35, the daughter of Louise Troh, went to her mother's apartment to check on him. He'd been vomiting and had diarrhea the previous night. When she arrived with crackers, Gatorade and tea, Duncan was too sick to come out for breakfast. Jallah, a nurse's assistant, took his temperature and blood pressure - both of which were unusually high - and called an ambulance. When it arrived, she warned the staff "this man is from a virus country." They returned in protective gear and gloves. Now Jallah is in self-imposed quarantine with her partner, Aaron Yah, and four children in their modest two-bedroom apartment. She's wracked with regret for not taking precautions. "I'm having all those bad feelings," she told The Associated Press. "I'm just doubting myself every minute. I'm trying to take my mind off it, but I can't do it." She doesn't kiss or hug her children, ages 2, 4 and 6, or her live-in partner's 11-year-old son or share dishes with them. She says she and Yah, also a nurse's assistant, often work nights, and had left the children with her mother and Duncan every night of his stay. Yah says he knows his active, affectionate children probably came in close contact with Duncan, but adds: "I know that with God, everything is possible, so I am just praying that nothing happens to them." Duncan remains in isolation, where he was listed in critical condition Saturday. Duncan has remained in contact by phone with some relatives, including Josephus Weeks, a nephew living in Charlotte, North Carolina. Duncan's mother is staying there. "It can be scary sometimes and it can be uplifting sometimes," Weeks says of their conversations. "The days when I'm able to get him to smile, to laugh, those days are good. That means that he's feeling good and he's got a little more strength to fight."